April 19, 2017 came and went like any other day, with few of the people I spoke to realizing the significance of the date. For those who aren’t aware, yesterday was the anniversary of the day the first shot of the Revolutionary War was fired; when the Kings soldiers marched on Lexington and Concord leading to the ‘Shot heard round the world.’ In some States April 19th is celebrated as a holiday, but in most instances April 19 is just another day; its significance lost in the fog of time. The Battle of Thermopylae was a famous historical battle in which a small contingent of 300 Spartans held off the advance of the much larger, (some estimate upwards of a million strong) army of the Persians for 3 days. The film 300, starring Gerard Butler as Leonidas, is loosely based on the Battle of Thermopylae, although Hollywood took extensive liberties with the actual events. I say there is a similarity between Thermopylae and Lexington and Concord because in both instances a small contingent of determined men held off a much larger force; and in the case of Lexington and Concord, were even successful in repelling their advance; forcing the Redcoats to flee back to Boston. While I’m not taking anything away from our Declaration of Independence, or he resolve of those men who signed it with the full knowledge that by doing so they were placing their lives on the line, if there ever was a day that should be an American Holiday, it should be April 19th. To me, the Battles of Lexington and Concord represent something that America has lost; that spirit of standing up to government when it seeks to deprive people of their fundamental rights. Although tensions between Britain and the Colonies had been on the rise for quite some time, it wasn’t until the King sent his soldiers to take away the Colonists guns that the Colonists put up any form of armed resistance. Today there are many phrases I’ve heard over the years that represent the same sentiment. For instance, “I’ll give you my guns when you can pry them from my cold dead hands” is one of them. Another one is, “You can have my guns when they are empty.” Both represent a willingness to stand one’s ground and never surrender the ability to defend one’s life, property, and liberty. I sometimes wonder what kind of convoluted logic people use when they compare the founding of this country to modern times. Our Founders, for the most part, are revered as patriots who fought to establish America as a free and independent nation. Yet the key word there is FOUGHT. America’s independence did not come to them simply because they signed the Declaration of Independence and mailed the King a copy of it; they had to fight to obtain what the Declaration said. Yet today anyone who even talks of the possibility of taking up arms against our government is looked upon as if they were insane. Those who resist the federal government’s intrusion into areas it has no business interfering in are vilified by the media and the people. Just look at how the media portrayed the Bundy’s or LaVoy Finicum; that is if the media even mentioned their names. One of the most famous incidents prior to the American Revolution was the Boston Tea Party; when the Son’s of Liberty, dressed as Native American Indians, rowed out to the ships owned by the East India Tea Company and dumped 342 chests of tea into Boston Harbor. How do you think the American people would respond today if patriots were to commit a similar act against someone they felt represented the tyranny of their government? How would the media portray those who committed such an act? The answer to those two questions says a lot about how much America has forgotten about what it means to stand up to tyranny. Today it is perfectly acceptable to condemn the actions of one political party, while standing behind your own; yet the moment you put aside the whole two party paradigm and protest government as a single entity you are viewed as a threat to society, a danger to national security, or even a possible domestic terrorist. One look at how people respond when you mention the name Edward Snowden is all you need to know about where people stand when it comes to their unalienable rights. All Edward Snowden did was to release information regarding the extent to which our government spies upon us. He released no information regarding the technology which made this spying possible, only that the spying was, in fact, going on. Yet he was vilified and forced to flee to Russia for sanctuary from prosecution. Had America been populated by true patriots, Snowden would have been given an award and it would have been our government that was forced to flee the country to escape the wrath of the people. In 1975 Senator Frank Church appeared on NBC’s Meet the Press, where he stated, “In the need to develop a capacity to know what potential enemies are doing, the United States government has perfected a technological capability that enables us to monitor the messages that go through the air. Now, that is necessary and important to the United States as we look abroad at enemies or potential enemies. We must know, at the same time, that capability at any time could be turned around on the American people, and no American would have any privacy left such is the capability to monitor everything—telephone conversations, telegrams, it doesn’t matter. There would be no place to hide. All that Edward Snowden did was to provide proof that our government had, in fact, crossed that bridge and was actively spying on every single American in this country. Yet his name, as well as the names Bundy and Finicum, are despised by many who consider themselves to be patriotic Americans. Today, what people know about government, about liberty, and about the principles this country was founded upon, could barely fill a thimble. Yet these people actively condemn people such as me who oppose government in its entirety for their constant abuse of power and violations of our rights. Just shows how much people know about what it really means to be a patriot. 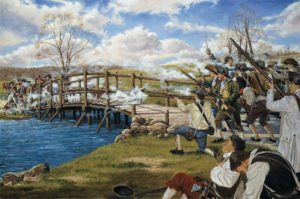 April 19, 1775 was such a day; a day when the Colonists in and around Boston took up arms to defend their most precious right; the right to own guns to defend their lives, their property, and their liberty. These ragtag militia members knew that they were outnumbered, less trained, and less armed than those they took up arms against; but to them that was unimportant. What was important was that a tyrant had threatened one of their most sacred rights, and as patriots they felt it was their duty to resist. That is what America has lost, and it is why April 19 should be celebrated across the land as a day which commemorated the bravery and patriotic spirit of those who stood their ground on Lexington Green; not a day that passes by just like any other day of the year.